BEIRUT — U.S.-led coalition airstrikes in the Islamic State's de facto capital in Syria are killing hundreds of civilians each month, according to monitoring groups, deepening already grave concerns for thousands of families trapped inside the city. At least 725 civilians have been killed in coalition airstrikes since the offensive to retake Raqqa began June 6, according to Airwars, a London-based monitoring organization that works with local activists, human rights groups and the Pentagon. "We had been flagging for months prior to the offensive that far more civilians were dying around Raqqa than we would have expected even a few months earlier," said Chris Woods, the director of Airwars. "Since the assault began, we have seen a casualty count that is relatively high compared to the rest of the coalition's war against ISIS," he said, using another name for the Islamic State. "In Raqqa, this means high numbers of identifiable civilians, many of them women and children." Lt. Gen. Stephen Townsend, the top U.S. commander in the country, said the Pentagon was aware of the reports. "I have seen the reports of increased civilian casualties, and it is probably logical to assume that there have been some increases in civilian casualties because our operations have increased in intensity there," he said at a news conference in Baghdad on Tuesday. "But I would ask someone to show me hard information that says that civilian casualties have increased in Raqqa to some significant degree." More than 270,000 people have fled Raqqa since the coalition offensive began. According to U.N. estimates, at least 18,000 more remain trapped in the city among the militants, often without electricity and surviving on limited supplies of food. The coalition has beefed up its team investigating claims of civilian casualties resulting from its strikes in recent months. 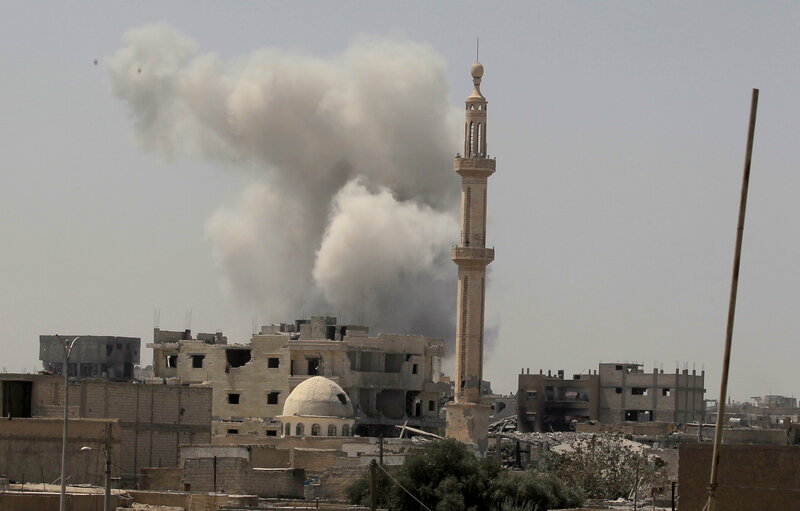 But the toll in Raqqa and Deir al-Zour, another militant stronghold in Syria, underscores the deep challenges facing the aerial campaign as militants use civilians as human shields in an attempt to slow the offensive against them. Residents who have reached a sprawling network of camps for the displaced across the surrounding province said they had been trapped in the city, with snipers targeting those who tried to escape. Some spent weeks behind the front lines without access to proper medical care, leaving charities with no choice but to amputate wounded limbs. 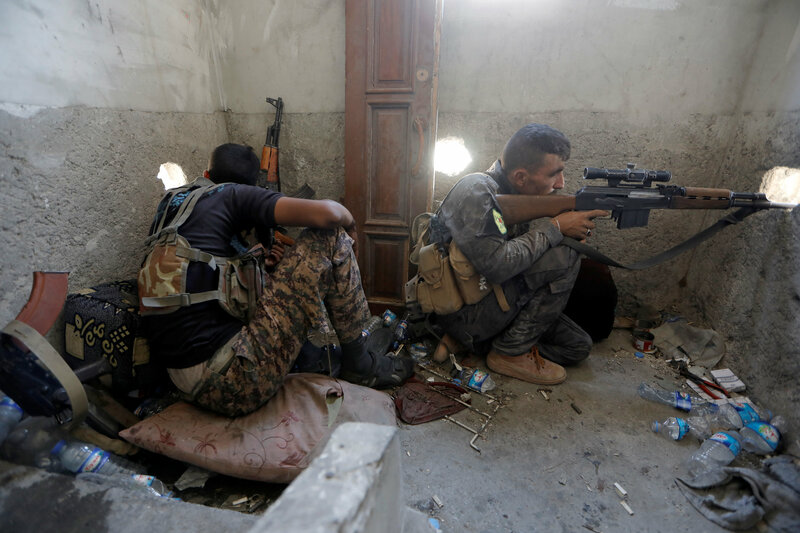 The bombing raids are being carried out in support of a Kurdish-led ground militia known as the Syrian Democratic Forces, or SDF, that is fighting house to house as the Islamic State unleashes car bombs, drone strikes and other attacks. On Tuesday, the Syrian Observatory for Human Rights monitoring group said it had documented 168 civilian deaths from airstrikes in Raqqa since Aug. 14. The Syrian Network for Human Rights has recorded the deaths of at least 458 civilians, including 134 children and 103 women, since June. In Baghdad, U.S. Defense Secretary Jim Mattis said there had been "no military in the world's history" that has paid more attention to limiting civilian casualties. "That said, an enemy that literally hides behind women and children or forces innocent people to stay in an area that they intend to turn into a battleground are clearly showing who are the people violating every standard of decency," he said. The intensity of the bombing campaign, combined with the Islamic State's stranglehold on Internet access in Raqqa, has made monitoring the situation on the ground more challenging than at any time during the Syrian war. Yet a handful of organizations are still documenting civilian deaths on a daily basis. "The thing that has really got us troubled is how confident the United States, Britain and the rest of the coalition is with this situation," said Woods, of Airwars. "How have we got to this place so quickly? We haven't been in the business of destroying cities since Vietnam." The deaths have proved a propaganda boon for the Islamic State, which published footage on one of its official propaganda outlets showing the bodies of at least four infants in what appeared to be a mortuary, one child still in striped pajamas. Heba Habib in Stockholm contributed to this report.